Donald Trump continues to lose ground in polls, even from the right-wing Fox News. It's part of a trend for the man who came into the presidency despite losing the popular vote. Fox News' newest round of opinion polling shows bad news for Trump from top to bottom. Trump's overall approval rating is down 5 percent from Fox's last poll, to an anemic 41 percent approval. By contrast, 51 percent of voters in the poll disapprove of Trump's performance in office. At a similar point in his presidency in Fox's polling, President Obama had 63 percent approval and 64 percent expressed confidence in his ability to make positive change. Only 47 percent have a similar belief in Trump. Only 7 percent of people in the poll say that "repeal and replace Obamacare" should be his top priority, which makes the Trump/Ryan decision to spend political capital on such unpopular legislation a strange one. The one issue area where Trump is slightly ahead is on the economy, where 47 percent approve versus 44 percent – but this is an issue on which he hasn't done anything. Trump is being buoyed by the Obama economy he badmouthed for years. It's downhill from there. Trump gets bad marks on immigration (41 to 56 percent), health care (35 to 55 percent), and America's relationship with Russia (33 to 55 percent). Trump's Muslim ban gets slammed by respondents to the poll as well. 54 percent of people oppose his decision to bar entrance to the United States over religious faith, and only 34 percent believe the ban will make America safer. 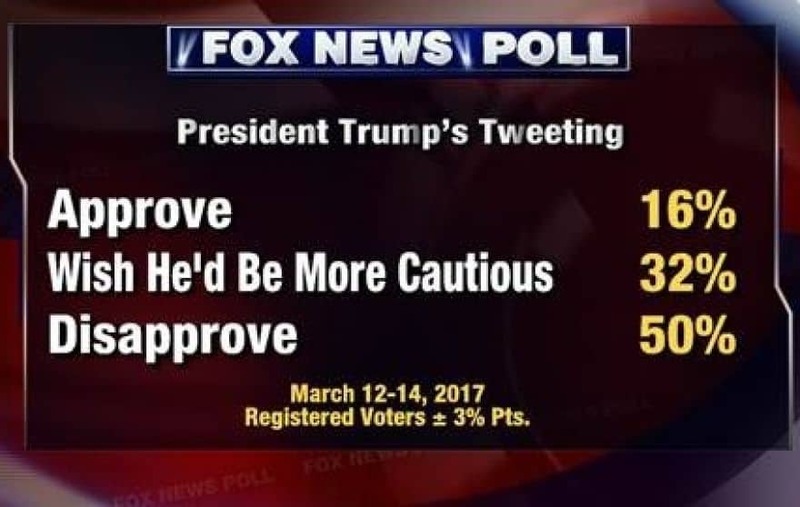 Even polling from the conservative Fox News is bringing bad news for Trump, and he doesn't appear interested in doing a thing to change course. Meanwhile, the Resistance gains steam.